Which is the greater challenge, the distance or what to wear to break a record? With little more than 10 weeks to go, those lucky runners that won places in this year’s 35th Virgin London Marathon will be steadily working through their training programme, with even marathon beginners already running up to 12 miles. Although the 26 mile course is a challenge to every one of the projected 36,000 runners, whether it be for personal best times or simply completing the course, it seems that going the distance is not their only concern. There are many other accolades to be achieved in taking part in this iconic race through London, the UK’s capital. With 30 Guinness World Records being broken in the 2014 London marathon for costumes worn by runners completing the race, it is evident that deciding what to wear and how to decorate your faces with loose glitter pigment is as much a challenge as the distance itself. Individual runners in the 2014 Virgin London Marathon generated £53.2 million in charity fundraising securing the event’s Guinness World Record for the largest annual single-day charity fundraising event worldwide, for the 8th consecutive year. With runners clearly dedicated to their charitable causes it is not surprising that runners fancy dress costumes get more and more extravagant each year. 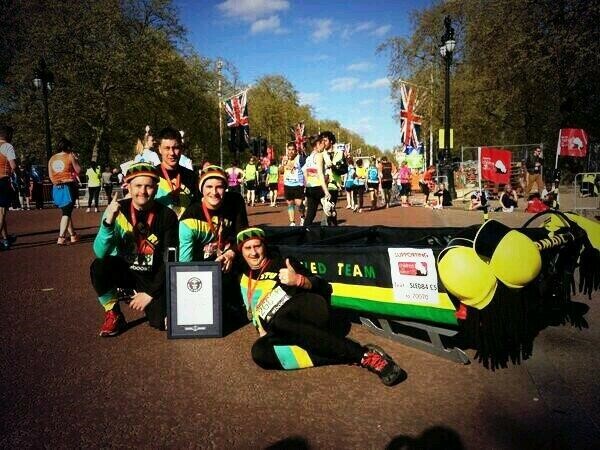 There are a number of Guinness World Records up for grabs too, which are broken down into the style of costumes worn. Four gentlemen from Wolverhampton adorned film costumes that replicated those of the bobsled team from the film Cool Runnings, complete with a 14ft bobsled, which they carried in support of Children with Cancer UK. In support of the British Heart Foundation, Sarah Dudgeon from Oxford achieved a great time in her wedding dress to claim her record. In support of WaterAid, who believe that everyone is entitled to clean water, Marcus Mumford from Worcestershire set a new title for running dressed as a toilet. These Guinness World Records are a massive achievement, which require a lot of planning, and even more race running to prove that the costumes are fit for the purpose and within health and safety guidelines by both the race organisers and Guinness World Records. We simply must admire the lengths these dedicated participants to go to for their charitable causes. As if running a marathon is not enough of an achievement in itself, these crazily devoted people adorn what can only be described in some cases as rather awkward costumes and spend their precious spare time training and fundraising. It is most definitely fair to say these people really do go the extra mile. Are you running the Virgin London Marathon this year? Are you wearing a costume or trying to break a record? We would love to hear your comments. For ideas of Fancy Dress Costumes for Worldwide Marathons take a look at www.costume4u.com for inspiration. ← Why do Cricketers wear white?